Being Canadian, my first real experience with French food had nothing to do with France. I’ve never been to Paris, and unlike many other food writers, have no tales of eating Oysters straight from the sea, or standing in lines at posh bakeries. My first sampling of what I consider really great French food came rather unexpectedly on my first night in Quebec City. I was 18 years old, and had just taken my very first trip by train. 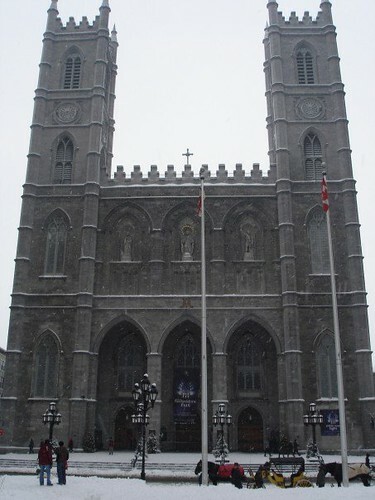 It had been a 12hr ordeal involving a transfer in Toronto and Montreal. 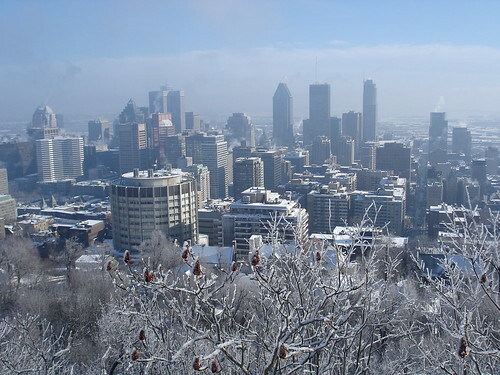 It was February, and I realized just how different French and English speaking Canada were when I switched trains in Montreal. The station was crammed full of fur coats and cigarettes. Both have been all but abolished in Ontario’s public spaces. When I finally got to Quebec City, it was well after dark, and I was able to see very little of the city as I rolled into the station. I had a long wait at the “Gare du Palais” because my ride was expecting me to come by bus for some reason. After a snow-silent trek into the city’s suburbs (Ancienne Lorette), I was ushered into an upstairs apartment and introduced to my host with a kiss-kiss to the cheeks. I’m convinced Quebecers do this to shock and embarrass Ontarians, whom they tend to consider stuck-up and puritanical. Inside I was treated to what I still consider my benchmark of French comfort food. Hot bowls of onion soup sat at each place around the table. Warm French bread was sliced and spread on a platter, and different pates and spreads had been placed haphazardly around the table. The lights were dimmed, candles were lit, and conversations were carried out in a broken French/ English hybrid. This is the moment I fell in love with French food. I’ve travelled many times since to Quebec City, Montreal, and once even managed to make it as far east as Rivierre-du-Loups. During each trip I’ve managed to improve my French, make friends, and have new experiences with food. While still a starving student with very little money, I had my first escargots in the beautiful dining room at the Chateau Frontenac. We filled up on bread and left a pretty lousy tip, but felt like we were among the nouveau riche as we left. That same trip I was introduced to “Fruits de mer”, a mixed seafood dish presented in a dinner plate sized sea shell. The thing I love most about Quebec is that the best food turns up in the most unlikely places. I had the very best poutine I’ve ever tasted in a bus station, while sitting on my luggage waiting for a bus. For anyone who doesn’t know what poutine is, or has only had a cheap imitation, real poutine is made using fresh cut french-fries, cheese curds, and beef gravy. I think the key is that the cheese can’t be of the processed variety, and the fries and gravy have to be piping hot. Quebec has some of the best cheese producers in North America. Montreal has it’s own food culture. Based heavily on both French and Jewish traditions, Montreal is the best place in Canada to get smoked meat sandwiches and bagels. It is also a good place to explore the more cutting edge modern French Canadian cuisine. 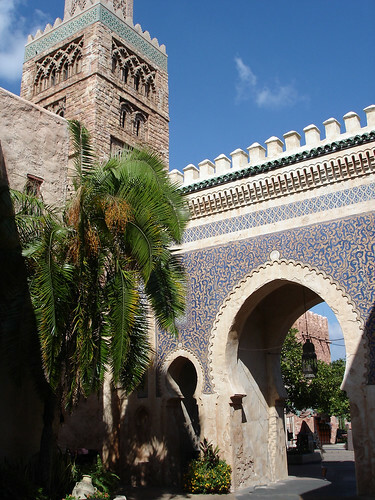 In my last year or two of high school, I seriously considered moving to Morocco as a post-secondary option. I wanted to see the world, and I could think of no place more foreign to a farm kid from Canada, than the north-west coast of Africa. I got books out of the library, studied maps, day-dreamed away entire math classes (I didn’t do so well in math). Something about the country had me hooked. The summer after high school, while working in tobacco, I befriended an Irishman named John. He had been to most of the countries in Europe, as well as Morocco. It was John who first warned me about the dangers of traveling in North Africa for a naive, blond haired North American. I would stand out like a sore thumb, and be an easy target for thieves. He painted a picture of a much more real and menacing but equally exotic location as the one I had been reading about. I decided to hold off on my Moroccan trek. Life has a funny way of happening to you when you aren’t paying attention. In my last year of college I was approached by a company who wanted to send me to Morocco for two years. I had a diploma in outdoor adventure and could speak french and English, and they were looking for someone to lead convoys over the Atlas Mountains, to the Berbers in the Sahara. I was thrilled at the prospect, but the deal eventually fell through. To make a long story short, their expectations and my own weren’t exactly compatible. To this day the Kingdom of Morocco haunts me. 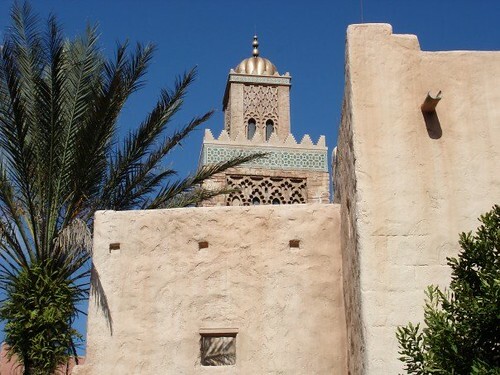 The Phoenicians, Romans, Christians and Muslims have each had a turn at ruling, and in spite of a very close proximity to Europe, and ties to the Middle East, the country is still very much African. French, Spanish, and Arabic can be heard on the streets, and this blending of histories and cultures is strongly reflected in the cuisine. Moroccan cooking relies heavily on saffron, mint, olives, oranges and lemons. Green tea with mint and sugar is a common drink. Chicken, beef and lamb are the most popular meats, and couscous and tajine are the dishes most commonly associated with Morocco. This is great to have on hand to make almost anything, from chicken and beef, to fish and vegetables, more flavourful and aromatic. A little goes a long way. Add all the spices to a dry skillet over medium heat, and stir occasionally until toasted (approx. 3 min). Allow spices to cool, then grind into a powder. place onion, garlic and ginger in a food processor. Finely chop. Add spices and remaining ingredients and blend to a fine paste. Use immediately, or keep covered and refrigerated for up to several weeks. 1. Thou shall not work with dull knives. Every kitchen I’ve worked in has had a large knife rack. The only kitchen I’ve ever worked in that didn’t make keeping those knives sharp a priority, I didn’t stay at for very long. In my opinion, if you use a tool all day, every day, you should keep it in top working condition. Hone that edge. 2. Though shall not work sloppy. Keep your work area clean and well organized. If your space is sloppy, so is your mind. This goes for counter space, as well as the fridge and floor around you. If you don’t work clean, you also don’t work safe, and may injure yourself or others in the kitchen. Make sure you work only for the best people. If you work for the best, then do what you are told. Learn from their years of experience. Listen to what they have to tell you. Stand on the shoulders of giants. There is usually only room enough for one ego in the kitchen, therefore if you are there to learn, respect your superiors. Although I have moved on and worked at several other kitchens, I still have great respect for my first master, who helped me build a strong foundation from which I was able to build my career. 4. Thou shall not waste. Use everything. Use all parts of the animal. Have a recipe that calls for only egg whites? Use the yolks for something else, like creme brulee. Leftover cake or bread? Dry it out and grind it up. Use the resulting filler in place of a little flour in a recipe that needs just a little dryness. All of the world’s great cuisines have many examples of economical uses for the whole product. Use everything. No matter what your culinary background, honour the classics of that cuisine. The classics are the building blocks you should use to perfect your technique. Once your technique has been perfected, then you can start to modify and create. Each kitchen I’ve worked at has had a seperate set of recipes they work from. When you learn a recipe write it down so you don’t forget how you did it years down the road. Also, When you try something new, and it works for you, write it down so you’ll remember what made that recipe work. 7. Thou shall not ignore the world of food. It can be tempting to put on blinders when learning a specific cuisine, but don’t block out other areas of food just because it doesn’t fit what you are learning right now. A pastry chef who learns charcutterie (meat) will be able to produce superior savoury pastry. A French Chef who studies the flavours of Asia will be able to use them to tweek the classics of his cuisine and create something new and unique. I don’t trust a cook who doesn’t taste his own cooking. Only by tasting can you guarantee the best results everytime. Learn to season things properly. If it doesn’t taste right, don’t send it out to the customer. I have already written a post about the use of fire in cooking. Master the use of fire, and respect the properties of heat. This is what transforms quality ingredients into amazing meals. 10. Thou shall not ignore criticism. Criticism, as long as it’s constructive, can be a great creative force. A lot of ego and emotion goes into cooking, so it’s easy to get angry at a critique, but if you are able to learn from it and use that knowledge the next time around, you be sure to get good results. Back in commandment one I mentioned the kitchen with dull knives. The head chef there was very insecure, and wouldn’t accept input from customers or co-workers. He would just get angry. This attitude doesn’t solve anything. It creates an environment of hostility and indifference in the kitchen. If you ever find yourself working in such a place, get out. It makes it impossible to follow commandment #3 if you don’t. montreal china town, originally uploaded by adelphos24. 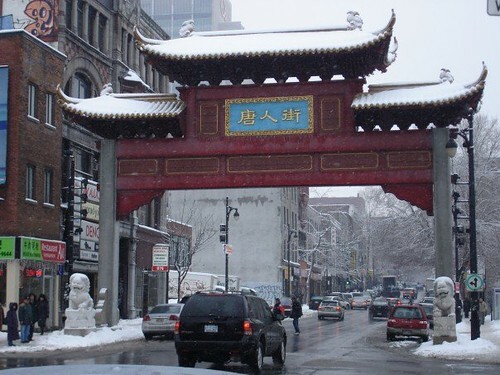 The first time I went to China town in Montreal, it was after dark, and the middle of January. People moved quickly from store to store, staying out of the cold. The lights seemed to amplify the frantic energy in the street. There were so many sights and smells, I was almost overwhelmed. As we went past a restaurant with a narrow red deck across the front, I noticed through the window a tray of buns I had seen being made at a chinese bakery earlier in the evening. We went in and got a table. The restaurant turned out to be one of the best Chinese buffet places I’ve ever been to. There was so much food!! They had a table set up with several rice cookers on them, each containing a different type of rice. The selection of food was unreal. One table had typical Chinese/North American food (chicken balls, egg rolls, etc.) Another had traditional Chinese food, while another had things you would normally see in a North American buffet. They even had pizza and sushi! You can’t go wrong with that combination (wink). I remember thinking it would be a good place to take picky eaters, because there was something for everyone. The service was very memorable, as well. The girl that waited on us asked to take our order in french, caught the english accent, so switched to english. I then overheard her speaking Chinese to one of the other wait staff. I was impressed. I don’t remember much about the rest of that night, other than feeling noticeably warmer as we strolled the back alleys with very full bellies.